When running in demo version, a watermark will be added to documents upon saving them. To run in full production mode, PDF Studio needs to be activated with the license key that was emailed to you after your purchase. 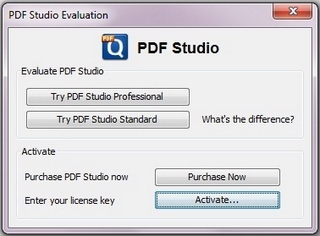 Once you receive the license key, launch PDF Studio, and a dialog will show up where you can click on the Activate button. If PDF Studio is already launched, the activate button is also accessible from the top menu, under Help > License Information. If your computer is offline, put it online temporarily to activate the software. If the computer can not be put online, contact PDF Studio Customer Support for help.